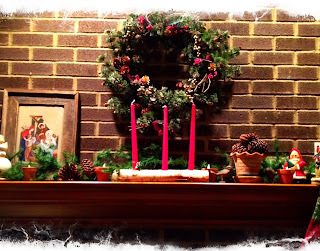 When a gardener decorates her mantel for Christmas she decides to give it a garden-y theme. She finds inspiration from an article on garden-themed holiday decorating sent to her by the Hoosier Gardener. She starts out with some faux greenery mostly because she doesn't have enough real greenery but also because she is a bit afraid of setting her house on fire after the dry summer. To this she adds an old trowel, a few packets of seeds, and a luminary light set in a clay pot. Hidden behind is a little mouse waiting for Christmas Eve when even he will be quiet. Just down from it she adds a little fancier clay pot filled with pine cones, which are real, with two little bird statues to add to the nature theme. 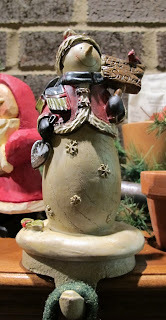 She includes the santa in the background because it is one that her brother-in-law carved by hand and her sister painted. She chose it from all the ones they made because Santa is holding a tree. In the center of the mantel she puts an old birch log candle holder that was always on the family mantel when she was growing up. It always had red candles in it, so that is what she puts in it. 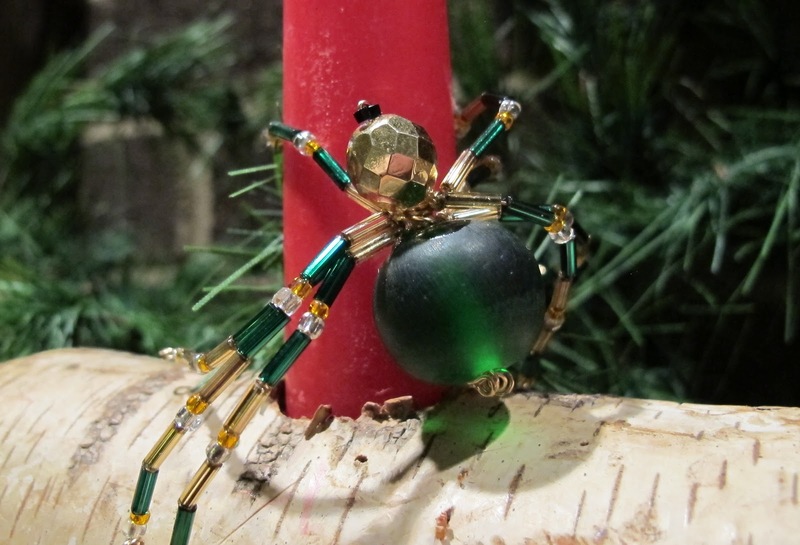 This year she also added a Christmas spider because spiders are our friends in the garden and she is working hard to accept this and not squish them when she sees them. If she decides to light the real candles in the birch log, she has a candle-snuffer made to look like a bee's skep to do it with. It took the gardener a long time find a suitable stocking hanger. Finally, though, she did find one that is a snowman holding a little trowel. He looks ready to do some digging, as soon as the ground is no longer frozen. 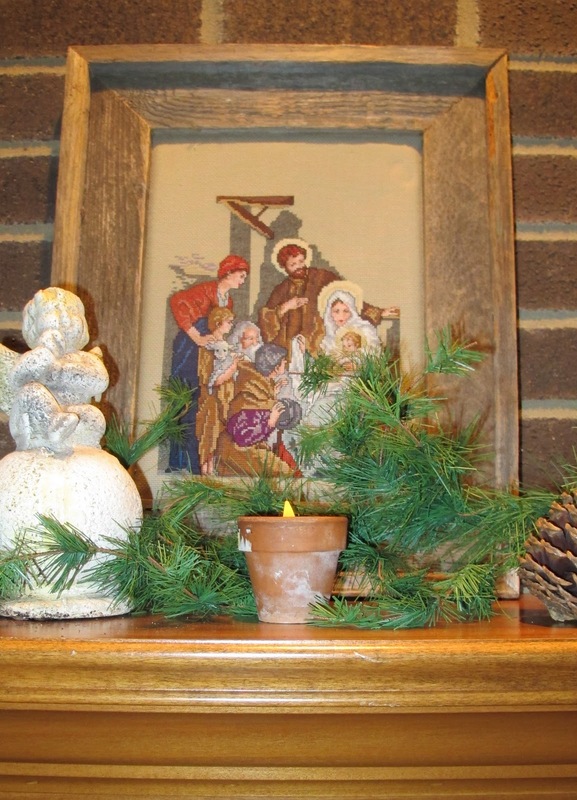 At the far end of the mantel the gardener includes a cross-stitch picture of the Holy Family on Christmas night framed in old barn wood to remind her of the reason we celebrate Christmas. Next to it, she adds an angel garden ornament, because angels are always a part of Christmas and often seen in gardens, too. 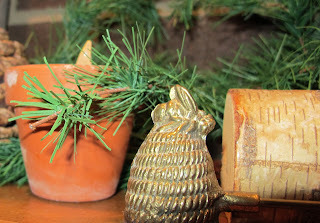 All across the mantel, she includes more pine cones and more little clay pots with lights in them. 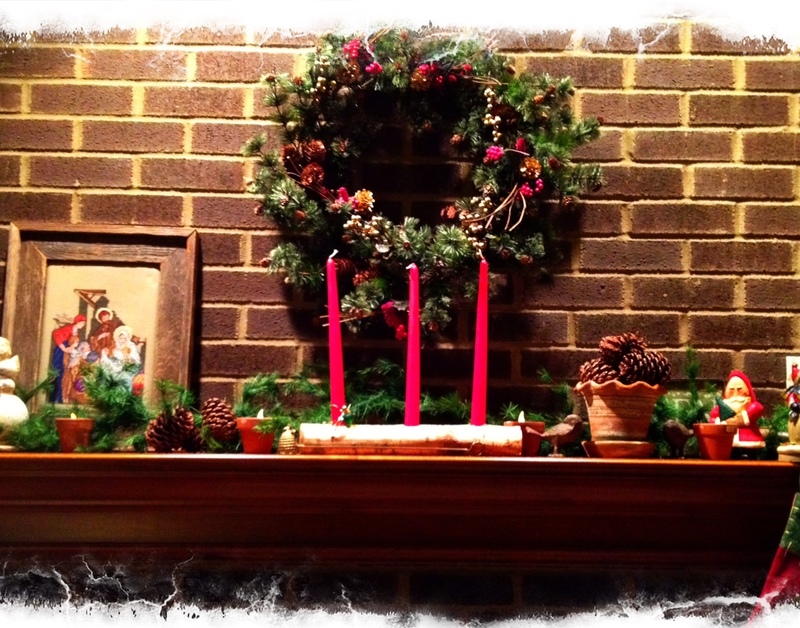 Then, when a gardener finishes decorating a mantel for Christmas, she stands back to admire it. Hmmm, maybe it needs some more greenery or a few live plants? When gardener decorates a mantel for Christmas, it turns out that it is really a collection of her favorite things, all dressed up for the holidays. It's not grand and glorious or elegant, by any means, but is unique to her and makes her happy. She will enjoy it throughout the season. When a gardener sends Christmas cards. When a gardener makes Christmas ornaments. When a gardener wraps Christmas presents. Pretty and special, just like you. I had forgotten about that log. Jealous! 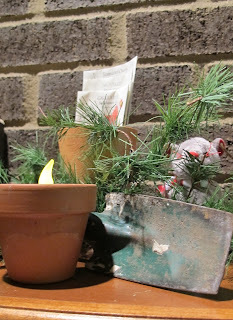 It is exactly what a gardener's Christmas mantel should be! 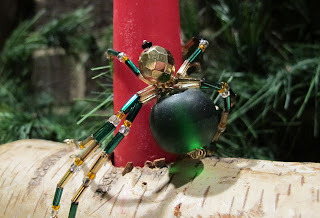 Love that spider! Only when they are in the house does it cross my mind to step on them - and as a rule I do not. Now I have to read Jo Ellen's. Very, very nice! (I was looking for a hoe!) ;-) Merry Christmas, Carol. I love it. Merry Christmas! I want a mantel to decorate! Yours looks so festive. I'm sure you could make room for a few live plants if you tried: holly and ivy, perhaps?